Taken a Few Months Ago When the Weather Was Warm! 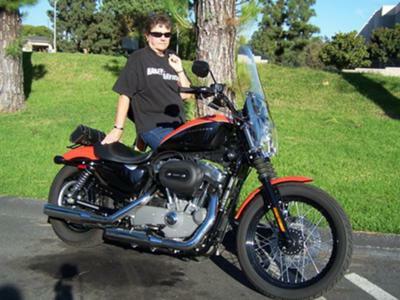 I took the motorcycle safety class at age 55, then was so excited to ride I bought this bike right away, even before getting my license! When I sat on it, I knew it was for me. Low, easy to maneuver, fun fun fun. Not to mention amazingly gorgeous too! I love everything about my bike except 2 things: 1) the gas tank is a bit small, so I have to fill up more often then most of my friends and 2) the rear shocks don't do much damping. That is because the bike is very low so there is only 1 1/2 inches of travel on the shocks. But I will replace them with some better ones when I have the money. But for now, when I see an unavoidable bump or hole, I stand up on the pegs just a little, and let the bike take the jolt, not me. Works fine unless I don't see it! My friends say I'll want a bigger bike someday, but I don't know about that, this bike is super fast and fun. I highly recommend anybody thinking about a Harley to take a test ride on one! At 1200cc you certainly have plenty of power! You're right about the rear shocks, but with standard pegs it's easy just to lift yourself off the seat when you can't avoid a pot hole, etc. I teased my friend and told her I would get in trouble (speeding) if I rode her bike much longer. It sure was fun! Enjoy!